Abstract: Pneumonia is the most common infectious cause of mortality in children worldwide. Chest x-ray (CXR) has been used as a supplementary mode in the diagnosis of pneumonia in children, but its frequent use might expose children to unnecessary ionizing radiation. In this review, we present up-to-date data of an alternative mode of imaging other than CXR in the diagnosis of pneumonia in children. We found that lung ultrasound is a safe and accurate mode of imaging that can be used by a health care provider in the cases of suspected pneumonia. It is more sensitive than CXR in the diagnosis of pneumonia and obviates the need for irradiation. Several authors studied the sensitivity and specificity of LUS compared to CXR in the diagnosis of pneumonia in children. Pereda et al3 performed a meta-analysis to summarize evidence on the diagnostic accuracy of LUS for childhood pneumonia. A total of 765 children were included in the meta-analysis. The authors concluded that LUS had a sensitivity of 96% (95% confidence interval [CI], 94%–97%) and specificity of 93% (95% CI, 90%–96%) in accurately diagnosing pneumonia in children. In addition, the positive and negative likelihood ratios (LRs) were 15.3 (95% CI, 6.6–35.3) and 0.06 (95% CI, 0.03–0.11), respectively. Copetti et al5 compared the diagnostic accuracy of LUS and CXR in children with suspected pneumonia. The study included 79 children with clinical pneumonia, who were subjected to both LUS and CXR. The results of the study showed that CXR was positive for the diagnosis of pneumonia in 53 patients, while LUS was positive in 60. Computed tomography of the chest verified the diagnosis of pneumonia in four patients with positive LUS and negative CXR. In a prospective study, Esposito et al2 compared the sensitivity, specificity, and positive and negative predictive values of LUS with CXR in the diagnosis of pneumonia in children. The study, which included 103 children, concluded that the sensitivity, specificity, and positive and negative predictive values of LUS in comparison to CXR were 97.9%, 94.5%, 94.0%, and 98.1%, respectively. In addition, LUS showed higher caliber in the diagnosis of pleural effusion. Shah et al4 conducted a prospective observational cohort study to assess the accuracy of point-of-care LUS for the diagnosis of pneumonia in 200 children and young adults up to 21 years of age. The authors calculated the specificity and positive LR to detail for lung consolidation of 1 cm or less with ultrasound air bronchograms not seen in CXR. The study concluded that LUS has a specificity of 89% (95% CI, 83%–93%), sensitivity of 86% (95% CI, 71%–94%), positive LR of 7.8 (95% CI, 5.0–12.4), and negative LR of 0.2 (95% CI, 0.1–0.4) for diagnosing pneumonia by visualizing lung consolidation with ultrasound air bronchograms. Table 1 summarizes the advantages of LUS. LUS is a safe and accurate mode of imaging that can be used by a health care provider in the cases of suspected pneumonia. It is more sensitive that CXR in the diagnosis of pneumonia and obviates the need for irradiation. Mastering the use of an ultrasound and identifying lung abnormalities lacks complexity, therefore, it is highly recommended that residency programs introduce an intensive short course of radiology as part of the core curriculum. World Health Organization. Pneumonia. Fact Sheet No 331. Geneva, Switzerland. Available from: www.who.int/mediacentre/factsheets/fs331/en/. Accessed March 22, 2015. Esposito S, Papa SS, Borzani I, et al. 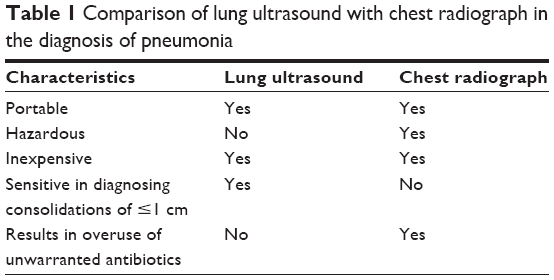 Performance of lung ultrasonography in children with community-acquired pneumonia. Ital J Pediatr. 2014;40:37. Pereda MA, Chavez MA, Hooper-Miele CC, et al. Lung ultrasound for the diagnosis of pneumonia in children: a meta-analysis. Pediatrics. 2015;135(4):714–722. Shah VP, Tunik MG, Tsung JW. Prospective evaluation of point-of-care ultrasonography for the diagnosis of pneumonia in children and young adults. JAMA Pediatr. 2013;167:119–125. Copetti R, Cattarossi L. Ultrasound diagnosis of pneumonia in children. Radiol Med. 2008;113(2):190–198.